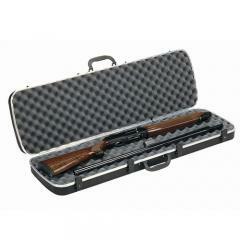 The Plano Model 10303 Gun Guard DLX Take-Down is a protective case for one takedown shotgun. Its sturdy hardshell exterior features an attractive alligator texture and durable full-length piano hinges, as well as an aluminum valance for reinforcement. The dual latches are key-lockable, allowing you to secure your firearm against unauthorized access, and the fold-away handles fold flat for compact storage while still providing comfortable portability. Inside the case, upper and lower layers of interlocking foam mold around your weapon, holding it securely in place and protecting it against shocks and impacts.